Warhammer Online Cheats Hacks Bots and Guides - The time for war is now. 1 – Make sure you have stackable items. 6 – The first stack will be locked. 8 – Have p1 right click on the first stack in the trade window and remove it from the trade. 11 – P2 trade window does not update the stacks change. - Find any craft merchant supplier. - He should sell the shattered figurine for 18 copper to you. - Turn around and salvage these for 50 copper. - This works perfectly for low levels as you can make some quick gold selling these. - On average you will make 5.4 gold per hour or 130 gold a day. - Easy money for a new toon. - Create a new txt file and take the following script below and save it as a .ahk file type. - Then start the script that ends with the file type .ahk. - The script will basically have your character jump every 5 minutes in the game. - You can change the jumping time in the game by just changing the games sleep value easily. The time is set up in millaseconds just so you know. So 1000 millaseconds will equal one second. - Travel Easy across WC bridge and make a left turn. - Your going to find two waterfall that are right next to the mountains. - Click on the dirt and you will now have a scepter. - Click on the scepter and then the mound again. - Travel to the chaos wastes. - Go south and hit NW Praag you should be around 16k 13k in the game. - Find Calvin Lankdorf and kill him at those cords. - If he isnt there take the road south from CW it should start around 20k, 500. - Look on your right side and see if you can see a mutated peasant. - If there is one then you need to wait to kill Lankdorf. Here is a Warhammer Online Exploit that makes it so you can kill mobs and loot them without having the fear of being attacked. This Warhammer Exploit will make you nearly invincible. Be careful when using Warhammer Online Exploits like this as you can be banned. - Go to grimbear station. - Kill the mobs below you and the cant hit you or make it to you. - Kill them when they are all dead and get easy greens and xp. - This is best with using AOE attackers such as sorceresses. - Here is an oldie but a good so if you dont know then you should learn to love this one. - First of all play the game in windowed mode. - Now find someone in the game you cant seem to climb. It can be anything you want such as roofs ect ect. - Now .2 seconds click the mouse button the games title at the top. - Let go of the title. - If done right you will climb on top of the structure you wanted to get on. - Now this doesnt work everywhere but it works alot of the time. - This is great for mob hunting and pking. - You basically can get to a spot no one can reach you at and in the end get easy kills. 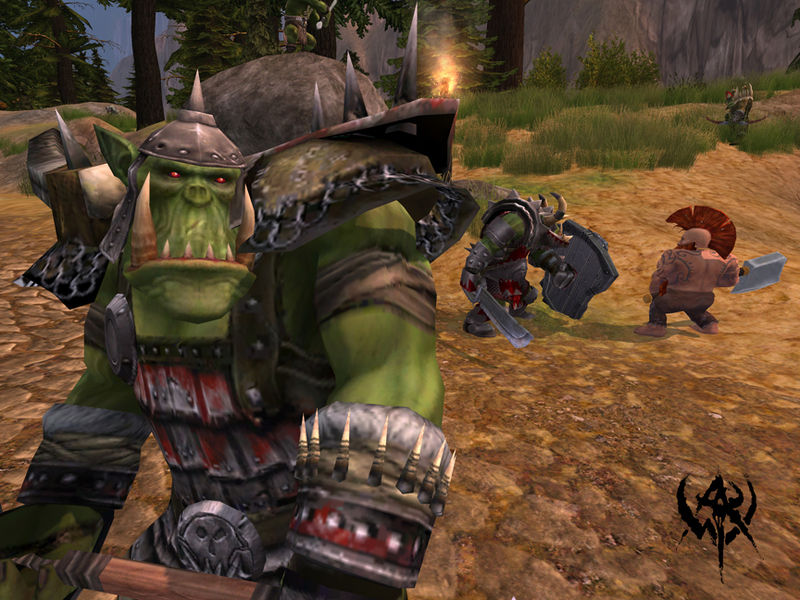 - Here are actually 3 different exploits that players can enjoy in warhammer online. - Now look for for explosive snotling. - You now have an extra chance to get a battle brew backpack. - Put on riposte tactic on. - Summon your white lion pet out 10 times. - Because of the bug with the riposte you will now have 100% parry. - Become untouchable to almost every player in the game. - Find a postern keep door. - Stand right next to it so you are in the way. - Due to the games current bug you will be blocking the door. - This can keep players from being able to actually enter the building or exiting. - Try using this pking as it tends to help ALOT. - Travel to the Choas Wastes. - Look around until you find a mob called Templar Armand. - He will be under a tree. - You will see around him a bunch of non-aggro mobs. - Do not pull them as they will ruin the spawn. - Now kill Templar Armand. - He will instant respawn from that tree and you can kill him over and over again. - Enjoy the easy XP and Leveling. HTML clipboard- Play as a shaman and do the quest Fragile light. - There you will find a staff that can fit into your ranged spot. - This normally would be pointless but the staff has some special features. - The key feature is you get a free 25 willpower and 17 wounds to your player and you are wielding 2 shamans. - The staff is powerbraced blasta, the staff is from the NPC known as Lilaeth Drakmist, the quest once again is called Fragile Light. - Go to the area of Mount Bloodhorn. - Then go zone located at 53500 , 44500 (it will be near a giant dwarf statue). - On the left of the status you can see a gap. Go in there and you will see a platform you have to jump to. Then go up a ramp and you will be at the cave of Nexx Gutslime. - When you find Nerx get some distance from him. He is a range attacker so you dont have to worry about him trying to melee you. The only attack he has that is somewhat strong is his pitiful dot that does around 300 dmg anywhere from 3 to 9 seconds depending on his cast. - It can take up to half an hour to kill him as a healer but its an easy kill. - After killiung him you can get an upgrade option, or you can make talismans from him and use that gold. The items you can get from killing him can be salvaged on average for 175 fragments but sometimes you will get 200 fragments. He at times will drop up to 2 weapons on death. - You can kill him every 12 hours as well.